Each year the Hult Prize, in partnership with President Bill Clinton and the Clinton Global Initiative, challenges students around the world to develop innovative social enterprises that aim to tackle pressing issues faced by billions of people. The winners receive $1 million in seed capital, as well as mentorship and advice from the international business community to launch their newly formed company. Regional rounds of competition are held each spring in Boston, San Francisco, London, Dubai, Shanghai and Sao Paulo, with a final round and awards ceremony held at the Clinton Global Initiative annual meeting each fall. The UC Santa Cruz team was one of 250 selected from more than 20,000 applications--from over 500 colleges and universities in over 150 countries--to participate in the regional finals. It consists of Terre Lee (double major in music and environmental studies), Kymberley Kudravy (double major in music and business management economics), and Justin Kohlberg (double major in music and film and digital media). Each team will present their case at the regionals for how they would provide sustainable, high-quality early education solutions to 10 million children under the age of six in urban slums. Lee has been teaching violin after school at Gault Elementary in Santa Cruz for the past three years, as part of an El Sistema program for children who can’t afford music education. The Hult competition is designed to give student entrepreneurs from around the world a platform to innovate and revolutionize the way society thinks about servicing the poor. The prize money is seeded into the newly created company, which will be run by the student team that came up with the idea. 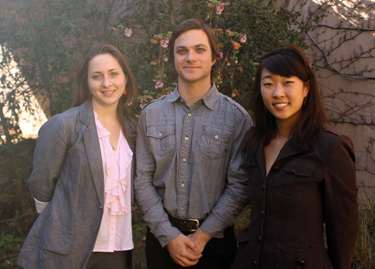 The UC Santa Cruz team will compete in the San Francisco regionals on March 13-14. Regional winners will then pitch their start-up at the Clinton Global Initiative annual meeting, where the winner will receive $1 million.